As you know, Halloween will be here before we know it! Today, the Webster's team is sharing some fun inspiration with you to get ready for the season. Our new line, Once Upon a Halloween, is perfect for doing so. Here's the project that I made to share with you. I found some ugly old frames in a thrift store a while ago. I painted this one white and added a coat of Lumiere to give it a sheen. Then, I decorated it to make a pretty home decor piece. It's sitting on my entryway table, but could easily go on the mantle or special place on a wall. I placed the Princess Petals in the corner, along with that cute owl from the Perfect Accents set. A scrap of ribbon from the Palm Beach line went perfectly, too. I cut some paper from the 6 by 6 pad and placed it inside. Then, using foam adhesive, I added a journaling card. I made the banner along the top, adding more resin flowers and Dazzle Me gems. Finally, I created the 'Boo' sentiment using the adorable kitty cameo as one of the 'O's. I edged it with silver stickles to tie it in with the chipboard letters. There are several "treats" hidden on our blogs today. So, be sure you've left a comment on all of them to have as many chances as possible to be a winner. You have until October 11 to do so. Winners will be announced on Friday, the 12th. My blog is the last stop! So, head on back to the Webster's Pages blog when you are done. Hope you enjoyed my project today! Thanks so much for stopping by. Never heard of Lumiere before, have to look it up. I love how you used a white frame and made it so glam!! It is beautiful and I fully intend to be inspired by it and create one for my desk. oh this cat is really something! Love the layout, it's so cosy and sweet! You made this frame into a true eye-catcher! The cat and banners make it look so cute! Anabelle, your layout is so very pretty!! I love all of the colors that you used, too!! I am in love with this cat, loved the flowers, awesome. 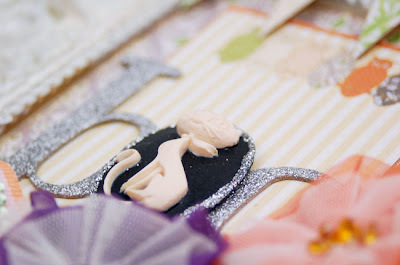 so pretty frame, i love how you decorated it! so cute !! I love !! Now the frame is no more ugly and it's stunning! Thank you for sharing! You made that ugly frame elegant & beautiful! love the flowers & ribbon! What a stunning creation you turned it into!! Why that's the prettiest Halloween art I've seen! LOVE, LOVE, LOVE that kitty cameo!! I love the flowers and the cat!!!! This is very cute and elegant!!! 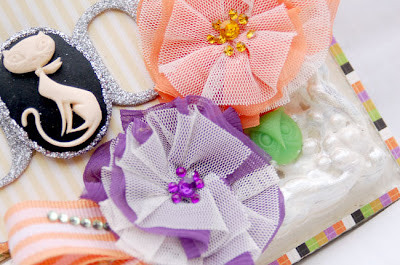 I love this, so elegant for a Halloween project!! Gorgeous. thanks for sharing, LOVE your blog!! this is so so cute!! Love how you altered this frame. the colors from the collection is just AMAZING! so very pretty. I love your flowers. What a cute little frame! I just love those princess petals! Wonderfully decorative piece! Love all the fab details! TFS! Those flowers are just gorgeous - can't wait to make those! I can see "adapting" you idea to a card. Intersting textural ideas. This is so Pretty! Love the cameo Kitty! and the bling added to the ribbon. very nice!! Anabelle, your project is really pretty. Trick or Treat! 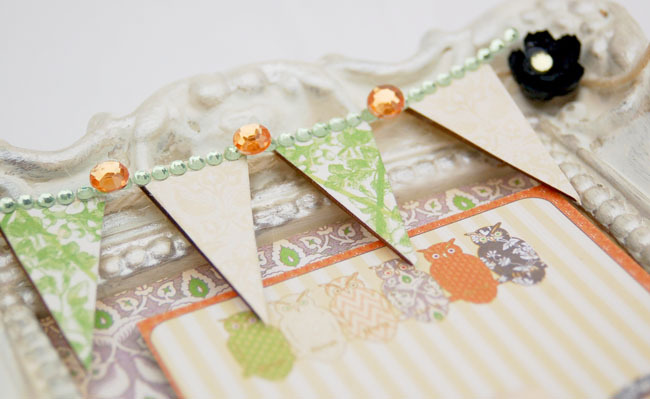 So pretty with non-traditional colors and flowers, beads, banner and cat cameo! So cute! I'm sure that it brightens your entryway. Love the frame !! It's adorable!!! Fabulous frame! Love all the embellishments. What a great repurpose job! Love your shabby frame! I love this! I need one! У вас интересные идеи . Много ручной работы . 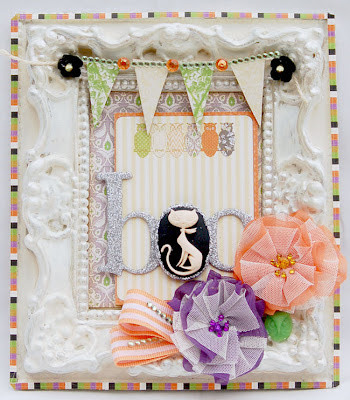 I really like the Kitty Cameo I've seen it used alot along this Webster's Trick or Treat Blog hop.. it's so cute. You done a fantastic job on this frame. Don't you just love it when you find something old and used and then you create something fantastic and new?? You've done an awesome job! Thanks for sharing! I love those fabric flowers.. so cute. Very dainty and pretty!!! Love the cameo and those flowers.sooo elegant, love to stare at it ....I really love it! !thanks for sharing. I love the elegance you've added to Halloween! From ugly to gorgeous! i LOVE this project, the colours look soo good together in this range and the way you have used the range looks super elegant....i love the cat! super cute!!! LOve it!!! The frame is wonderful! awesome altered frame! fab details! i love the frame and the layout~ GOOD! I love this frame!!! On my way to dig out an old frame and get busy! Thanks for the inspiration!!! Great project! And a lightbulb just went off! Cute elements, and inspiration! Thanks for sharing !! I love this framed work of art and your scrapbook layout below it. Thanks for the lumiere tip! I've never tried it. Now, I'm off to find an old, ugly photo frame and create magic! The frame is beautiful!! I would love to be greeted by it in anybody's home!! So pretty...the flowers..the pennants..the kitty! I love what you did with this, what a fabulous and unique decoration! Palm Beach meets Halloween - a match made in Heaven. Isn't it wonderful how you can cross patterns to make an exciting layout. I love how you placed the cameo cat in one of the 'o's of the word BOO. Thanks for sharing this with us. Wow! This decorated frame is awesome! I love the trim and combination of spooky and beautiful! I sure can tell you...that frame isn't ugly anymore! I love it! Thanks for the chance to see your work. Love your LO! Most impressed with how you trimmed the cat with glitter to match the other letters! Love this Anabelle! The frame and silver stickles look awesome with this collection! Love the light color of the perfect petals! Very different from the standard dark and bright Halloween colors. Thanks for the chance to win free stuff! Now this is cute! Cute in a frame!! I love that cat as a letter. I love this. I have some old frames...thanks for the great inspiration! Oh my! I just LOVE this ... and how you featured the kitty cameo ... cute, cute, cute! So shabby chic. I love that frame. Simply beautiful. I love the idea of upcycling old things. Very, very cute. Beautiful!!! I love repurposing ugly frames! Thanks for the inspiration! Love this project! You have inspired me to dig thru some old frames! TFS! Love your project. The adorable kitty in the "boo" is so sweet. Love all the beautiful embellishments. Love your project. That cat is sooooo cute. You did an amazing job with your frame! It is so wonderful with all the lovely details! I don't have the patience to go to thrift stores and probably wouldn't see the potential, but boy do I love what you did with your find! Thanks so much for sharing!!! This is just gorgeous, Anabelle! Love the soft colors and beautiful flowers! Your Halloween project is so beautiful. This is so delicate and lovely.What a beautiful take on Halloween.I love your vision. BEAUTIFUL !!! It's my favourite project from the blog hop ! Well done ! Awesome!! I love your accent piece I am sure it looks awesome in your house, can't wait to try this!